Raising capital from venture capitalists at any stage can seem like a very strange, ambiguous and amorphous process. I’ve written about the way Redpoint diligences/researches a startup and its market and what questions we tend to ask at each stage. In this post, I’ll focus on the process from entrepreneur’s point of view. When raising capital, entrepreneurs will see potential investors move through four phases of investment decision-making process: screening, socialization, diligence, and decision. I’ve drawn a schematic that illustrates this evolution above. The chart also shows a line indicating the progression from one step to the next, using data from my own investment funnels. Screening: the first call and/or first meeting. The screening step can include associates, principals and/or one or two partners. In this phase, investors are evaluating the risks of the investment, the market size, and the industry, to determine if it’s a fit with their fund size and investment goals. Looking at my CRM data, roughly 15% of startups continue onto the next stage. Socialization: excited by a startup’s pitch and prospects, the partner/team who met with the company will share their knowledge with other members of the firm. VCs typically ask for second meetings during socialization. In second meetings, founders repeat the pitch to a broader group within the firm, though typically not the entirety of the partnership. If the deal team resonates with the founders and the opportunity and vice-versa, the deal team begins diligence. 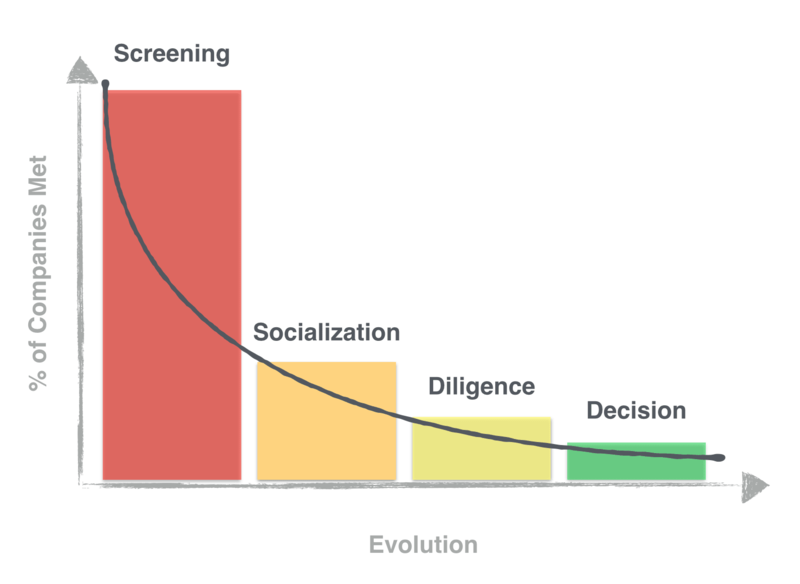 Again, about 15% of startups move onto diligence. Diligence: the deal team begins researching the opportunity and share their findings with the broader partnership. This includes evaluating the team, the market, product roadmap and sales pipeline. Behind the scenes, VCs call contacts in industry to refine their point of view. As the research progresses, VCs will often volley questions back to the startup, seeking clarification. Typically, the diligence process is focused on a few key questions like market size, defensibility, regulatory risk, or competition. Increasingly, investors and founders discuss deal structure and outline deal terms at this stage. After diligence, about 10% of startups continue to the final “Partner Meeting,” a meeting of all the partners in a venture firm, or the entirety of the VC’s investment committee. Decision: This the “Partner Meeting.” Beforehand, the deal team briefs the partnership on all the diligence materials, key questions, and deal terms. Founders pitch the entire partnership. After the meeting, all the partners debrief on the opportunity. Some firms provide deal teams latitude to make decisions on their own; others have implemented rigid voting processes to seek approval for investment. Granted approval and with a term sheet in hand, VCs then must convince an entrepreneur to sign their term sheet and partner with them. In the past 2 years, I’ve been lucky to invest in three companies (Axial, Electric Imp and Looker), for a success rate of 6% in this stage, or 0.2% throughout the process. For founders, it’s important to understand where they are in the process with investors for two reasons. First, so as not to misjudge the finish line either by running out of capital in the midst of a process or presume success at too early a stage. Second, to build auction pressure in financings to create negotiating leverage on terms. Keeping VCs in stride with each other is one tactic to accomplish this goal. The first part to ensuring a successful fund raising process is understanding the milestones. But ideally, after this process is completed, a founding team and an investor have built a strong and mutually beneficial relationship that will last many years and throughout the company’s ups and downs.